Area 107 A. 0 R. 26 P.
Anne McDonagh John Dooley Private dwelling with 1 rooms. John Tigue John Dooley Private dwelling with 5 rooms. Patrick Dooley Patrick Dooley Private dwelling with 3 rooms. Augustine Martin John Dooley Private dwelling with 2 rooms. 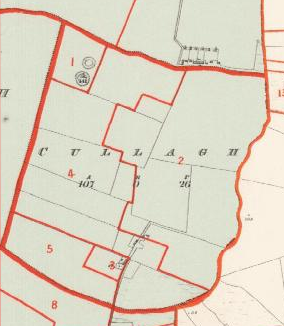 Cullagh : Inq. temp. Car. I.
E. by Cloonbanaun td. ; and N. and W. by the td. of Kinlough. It contains 107a. Or. 26p., and is the property of Mr. Roche. Agent, Michael Dowdall. It is held by Mr. Jameson at the yearly rent of ?1 18s. per Irish acre. Mr. Jameson sublets it to Cottiers at …per acre. The tenants are all Catholics. There are two ancient forts in this td.